Cancer’s reach knows no boundaries, and the cancer patient is only one of the people affected by a diagnosis. The patient’s family endures distress and other emotional struggles during a loved one’s cancer journey. For these reasons, as part of the Patient Empowerment Program, we provide our breast cancer patients with referrals to retreats, services and exercise programs to support them and their immediate family. One such program is Camp Kesem at Stony Brook University. Offering a FREE one-week sleep away camp experience and continuing peer support for children of individuals who have been impacted by a cancer diagnosis, Camp Kesem provides support to kids through and beyond their parent's cancer with innovative, fun-filled programs that foster a lasting community. Several of our patients have taken advantage of this opportunity and are so very grateful that their children have had this unique experience; and as a bonus, their children’s time at camp offered some crucial free time for themselves. Those who have attended continue to be part of the program. Registration for Returning Campers is open now! New Camper registration will open January 15th! We suggest that you apply early to assure a place for your child. Contact me if you or your child would like to talk with someone who has attended this unique program. Or you can click here to read about 9-year-old Daniel’s memorable Camp Kesem experience. The first Camp Kesem was founded at Stanford University in 2000 and has expanded to over 80 chapters in 38 states across the country. 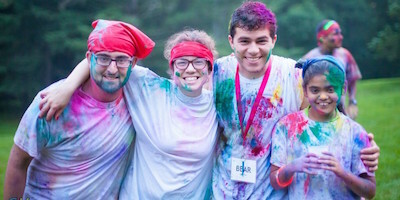 Camp Kesem at Stony Brook University (CKSBU) was founded in 2013, and is operated by more than 50 student volunteers and can serve 100 campers ages 6-16, per year. In the spring of 2013, a group of Stony Brook University student leaders applied for a $10,000 LIVESTRONG grant and a bid for a Camp Kesem charter. Stony Brook was selected through a national online voting competition as the most voted for school in the northeast region. Stony Brook’s first year was very successful as they served 52 campers and raised over $50,000. They continue to show their potential for growth as they have increased the number of campers they can support and amount they raised in subsequent years. Their goals for 2017 are to raise a $90,000 and touch the lives of 100 campers this summer. For more information about CKSBU, click here for their newsletter.